Lesions from optic tract to visual cortex cause contralateral homonymous hemianopia (i.e. defect of vision in right when left pathway is impaired and vice-versa). Inferior nasal hemiretinal fibers loop into the proximal contralateral optic nerve – anterior Wilbrand’s knee. 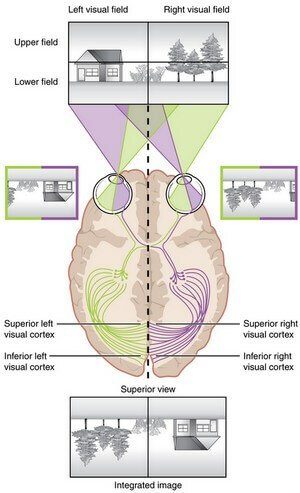 The inferior nasal hemiretinal field corresponds to superior temporal visual field. Superior nasal fibers form a redundant loop in the ipsilateral optic tract – posterior Wilbrand’s knee. Remember: Macular fibers that cross do so in the central and posterior portions of chiasma. They produce centrally placed bitemporal scotomas. Grey matter is split into 6 parts by the white matter. Axons from the ipsilateral eye end in laminae 2, 3 and 5. Axons from the contralateral eye end in laminae 1, 4 and 6. They divide into parvocellular and magnocellular subtypes. Optic radiations extend from Lateral Geniculate Body (LGB) to Visual cortex. 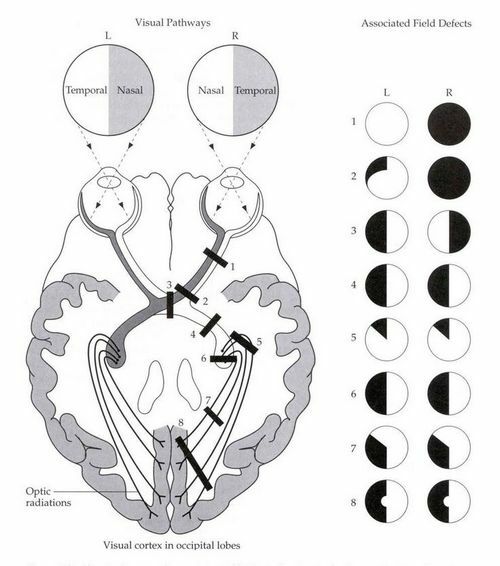 Meyer’s loop (Inferior retinal fibers) – pass through temporal lobe looping around inferior horn of lateral ventricle to the lingual gyrus (occipital lobe below calcarine sulcus). Baum’s loop (Superior retinal fibers) – pass through the parietal lobe to the cuneus (occipital lobe above calcarine sulcus). 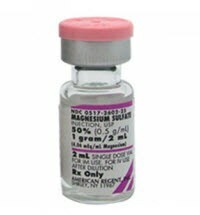 These fiber pass through retrolentiform part of internal capsule. This is called contralateral homonymous hemianopia and also Wernicke’s Hemianopic pupil. 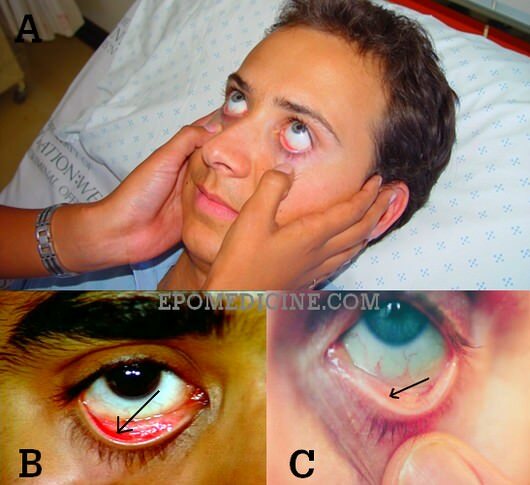 Present in lesions of Lateral Geniculate Body (LGB) and pathway anterior to it – Descending optic atrophy. Absent in lesions posterior to LGB (i.e. optic radiations and cortex). This is because 2nd order neurons synapse in LGB. Defect in lesions anterior to LGB. Normal in lesions of LGB and pathway posterior to it (i.e. optic radiations and cortex). Hence, pupils appear to be dilated when light is shown on affected eye relative to the normal eye. Accomodation reflex: E-W nucleus activation leads to pupillary constriction and contraction of ciliary muscles makes lens more spherical and powerful. 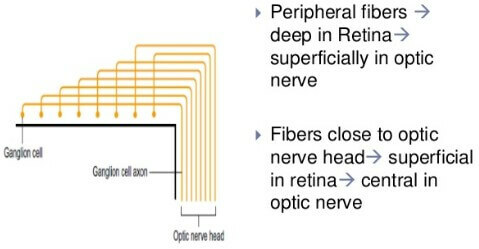 Unlike in the light reflex, projections are from the supranuclear level (corticonuclear fibers from frontal eyefield) in near reflex. Ipsilateral absence of near reflex (E-W nucleus and tracts further are also the part of accomodation reflex). Ipsilateral fixed and dilated pupil leading to Anisocoria (Affected eye is unresponsive and apparently perceiving dimmer environment with impaired consensual light reflex from the opposite eye as well). The 2nd order neurons (Ganglion cells) do not synapse in LGB in the pathway of light reflex. It passes between the LGB and MGB to end in ipsilateral pretectal nucleus. The internuncial fibers project to bilateral Edinger-Westphal nucleus from the pretectal nucleus which forms the basis of consensual light reflex. This is a condition when light reflex is absent and near reflex is present. 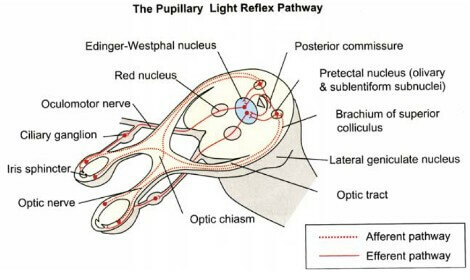 The consensual light reflex is mediated by the internuncial fibers from pretectal nucleus to bilateral E-W nucleus. 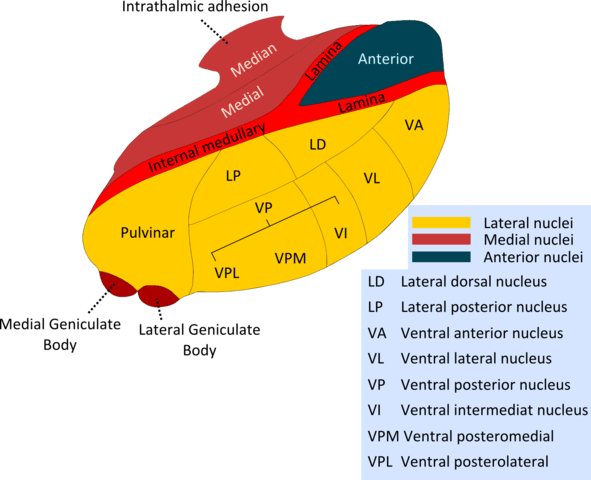 Hence, afferent lesions around this region gives rise to near-light dissociation because the afferent fibers of near-reflex that enter E-W nucleus more rostrally in midbrain and are spared. 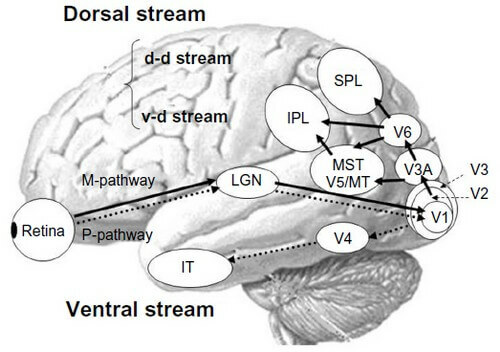 Convergence reflex pathway is unaffected as it starts from the medial recti, leading to near-light dissociation. 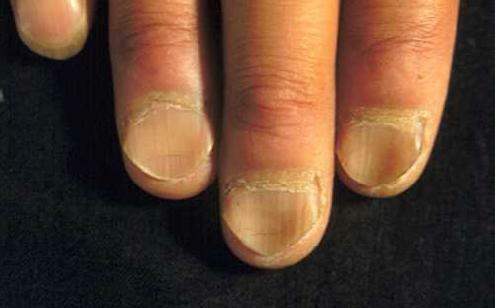 Injury to ciliary ganglion and or post-ganglionic fibers resulting in abnormal regrowth of short ciliary nerves. Near-reflex is not spared but restored later and hence, also called pseudo-near light dissociation. Hence, with random regeneration of fibers, power of accommodation is likely to recover, whereas the light reaction will not. Like a single eye Argyll-Robertson pupil. Contralateral corticospinal tract involvement in crus cerebri: Ipsilateral hemiparesis (False localizing sign, i.e. 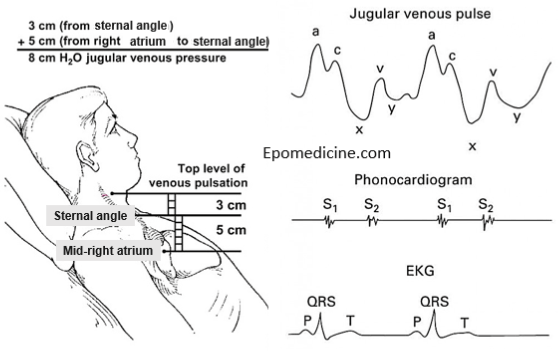 UMN sign is expected on side contralateral to the lesion but seen in the ipsilateral side). 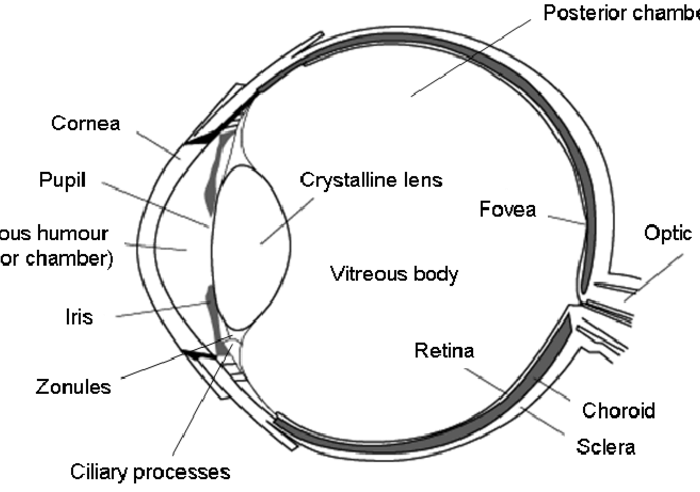 The visual field projects onto the retina through the lenses and falls on the retinae as an inverted, reversed image. The topography of this image is maintained as the visual information travels through the visual pathway to the cortex. 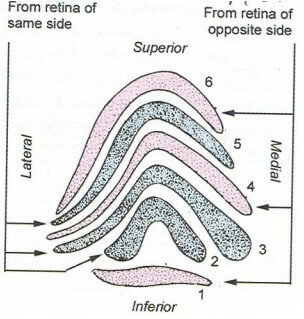 Area V1 (aka striate cortex) is the primary cortical processing area for macular retinal images. Areas V2 and V3 (aka extrastriate cortex) are the primary cortical processing areas for peripheral retinal images. Areas V4/V8 (aka occipito-temporal region corresponding to lingual and fusiform gyri) is the center for color processing. Lesion leads to achromatopsia (defect in color perception). Area V5 (aka temporo-parietal-occipital junction) is the motion detection area. Lesion leads to akinetopsia (disorder of motion perception). Lesion leads to visual object agnosia (loss of object recognition). Lesion leads to prosopagnosia (deficit for recognition of familiar faces, such as those of family, friends, and colleagues). Lesion leads to difficulty in recognition of familiar environment. 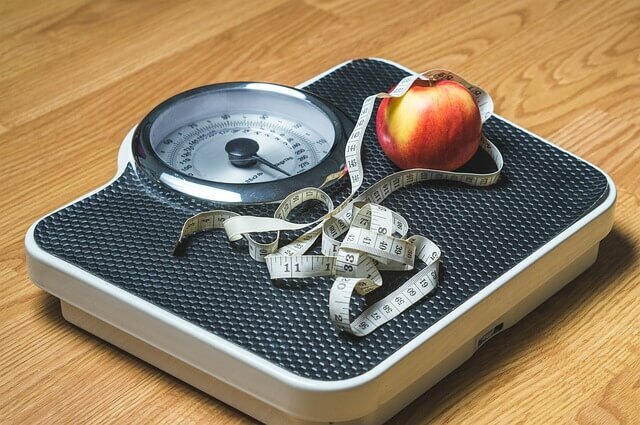 It tells the motor cortex where to move to produce a desired effect. Lesion leads to optic ataxia (impairment of reaching for objects in the environment) and oculomotor apraxia (impairment of voluntary eye movements to command). Bilateral lesions in V1 have bilateral blindness but are unaware of their deficit (anosognosia). 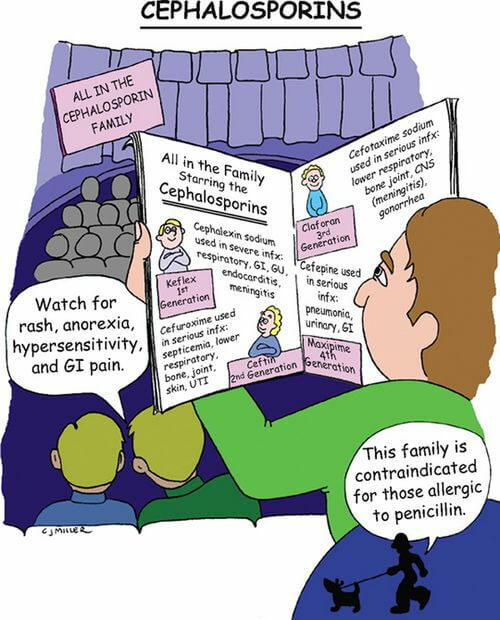 When asked directed questions about their environment, patients with Anton syndrome confabulate confidently.